Hurricane Irene is changing my plans. I tend to book myself fairly tightly so when something like this happens, I end up with "found" time. I love this extra time regardless of how I choose to spend it. In my younger years, I would have been highly stressed at a time like this. Now I am not only calm but thankful. So part of the key for me is to find a creative oasis regardless of where I physically am. Hatsize was praised by 451Group on their good execution in the cloud. Some people suffer from distraction when they are on a computer. There is a Google Chrome plugin that allows users to self blog to stay focused. Loved the site - Humility Imperative. Leaders need more humility. I invest in humble people. One way I research challenges is by reading every book I can lay my hands on about a topic. Getabstract stole this idea (OK more likely they thought of it at the same time) and brought out the concept of knowledge packs - abstracts around any specific topic. Genius idea. 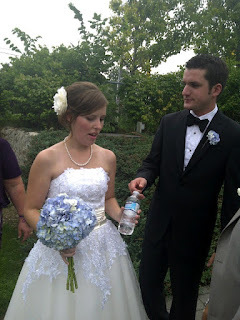 My son got married to a wonderful woman today. Great event. All went smoothly. And what else happened? Oh yes, David and Amy had a nephew. It was a preemie. He is doing well. And I learned last night the Amy was also a preemie. 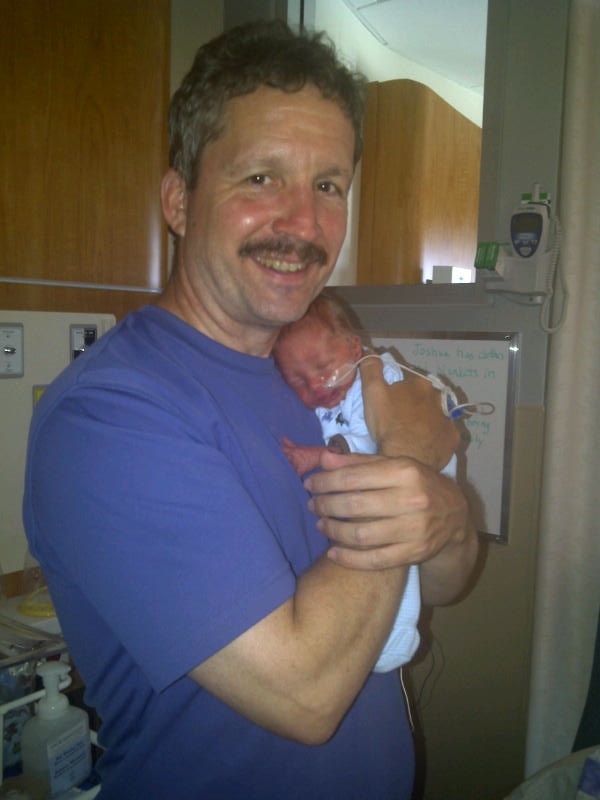 I was not surprises since we all know preemie is short for Premium and Amy certainly is a premium woman. Not only is does she knit, do needle work, she is beautiful and intelligent and she bakes. Amy, Elizabeth and I would like to welcome you into our family. We would like to wish you and David a long and happy marriage. And of course the new nephew means I am a grandfather. I choose not to be old but it does make me wise. And in keeping with my new wisdom, wise people do not do long speeches. 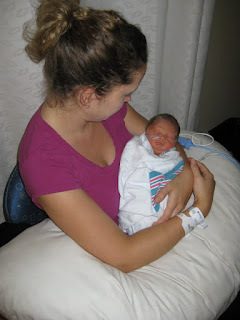 And a bonus pic of my daughter and new grandson (he gets out of the incubator for the occassional cuddle). My daughter Beth and son-in-law Chris had a baby boy this morning. 8 weeks ahead of schedule (thinking he should go into the software business - he would be unique). 1.5 Kg (4 pounds, 4 oz.). Mom and Josh are healthy and all is well. We are having a lovely rain day today. The gardens need it. I read a great book by Clay Christensen, Jeff Dyer and Hal Gregersen called The Innovator's DNA - Mastering the Five Skills of Disruptive Innovators. Christensen is one of the great thinkers of our time. Start by reading his book - Innovators Dilemma where he explains what disruptive innovation is. The Innovator's DNA builds on his many previous books by laying out the skills needed to innovate. He not only explains the skills but gives hope that anyone can learn them and explains how. 1 - Associate. Innovators associate previously unconnected things to come up with products or ideas. Innovators apply ideas from completely different areas to their field. 2 - Questioning. I have long been an advocate of the "How" question. I think people are sometimes frustrated by my questioning the status quo. This would be why the 5 Why's process of improvement works. I even wrote an article on the power of questions on Ezine. 3 - Observing. "Observation is the biggest game changer" - Scott Cook - founder of Intuit (I have met Scott a few times and he is one of the nicest person you could want to meet. I say this and I do not even like accounting) Obviously learning is greatest when things are observed. 4 - Networking. Again, something I do naturally. It would be one of my greatest strengths. 5 - Experiment. This, for me, would be summed up by my Fail Often, Fail Fast, Fail Cheap mantra that I always say. I would rate very highly on the innovation chart. If anything, I need to focus more. "Innovators like to work for other innovators"
Perhaps that is why whole companies seem to attract high innovation people. The garden is awesome right now. Fresh tomatoes, string beans, zucchini, lima beans, carrots, beets, onions, leeks, pumpkin and of course most herbs (basil, chives, parsley, thyme, rosemary etc). Even a few blueberries and a small second crop of strawberries. It is a problem of abundance. Carrots are good but carrot tops are too prolific to eat so freezing some. I am not real keen on carrot tops although they "disappear" in most things in great quantity. It is easy to "disappear" a couple of cups in almost anything. I love beet tops but they are not as prolific this year. The photo is a volunteer squash in the compost. 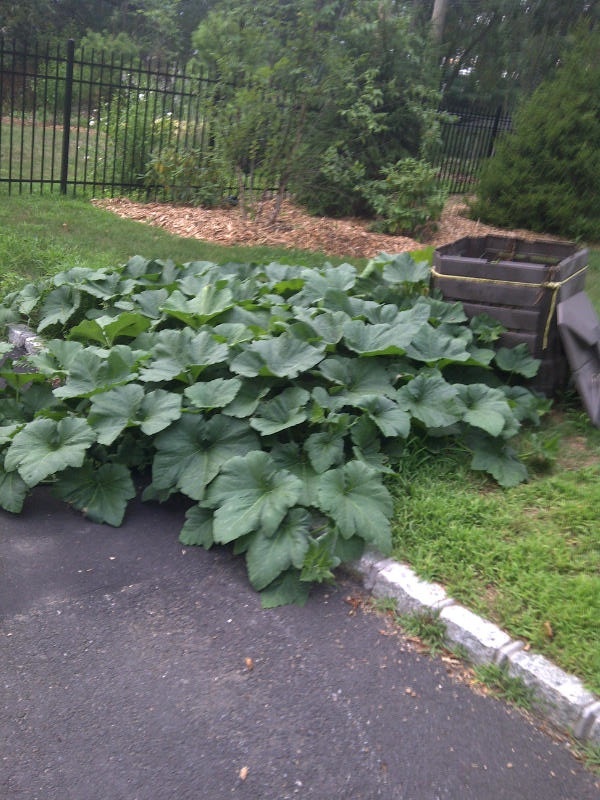 I fondly recall my brother Glen often had great volunteer squash in his manure pile when he lived on the farm. I tend to avoid controversy so one of my time management rules is I do not do politics. So hoping this post is not too political. I read a great book - Clean Energy Nation - Freeing America from the Tyranny of Fossil Fuels by Congressman Jerry McNerney Ph.D. I have a deep history of environmental stuff. I started a recycling program at U of Waterloo in the 1980s. I started an environmental detergent company - Simply Clean. And my brothers and son are deep in the environment movement. Brother Glen started Skygeneration that sold to Sprott Energy (I count that as one of my successful exits this year even though Glen did all the work to make it happen). Brother Lyle runs a biodiesel refinery, taught it at a community college and wrote a book on biodiesel. And my son, David, runs Estill Energy, a solar company. Environment should not be a political issue. It just seems obvious. We should not destroy the planet. It should be the common goal that unites. I smiled at the bumper sticker - "Earth First - We can destroy the other planets later". Of course it was on an SUV. The book covers the history and stats of climate change. McNerney is a politician so he delves into the politics(which are appalling). He has a good chapter on Hubbard's peak( the time when we hit peak oil production). There is a great chapter on energy and national security. Of course he is talking about the US when he says national. But much of it applies to Canada as well. I also liked the chapter on public health. Over 50% of US electricity is produced by coal. On a personal note, I notice in NY, when I clean the inside of the car windshield, there is a black soot. Very unnatural. What I have learned (from Simply Clean) is people are primarily economic driven - not "feel good" or "social good". This means for true change to happen, there needs to be the right policy. Tax energy use - do not subsidize it. I am discouraged by US politics and worry that no politician will be brave enough to do the right thing for the environment. His prognosis is scary enough to make me consider building a better cabin on my property in Northern Ontario. It is a worthwhile book. Read it. I also read a book summary on Getabstract that ties in more of the practical of what a company can do called Earth, Inc. I like reading books but also love speed learning so often read Getabstracts.